The Board of Directors is comprised of the Executive, being the President, Vice President, Secretary and Treasurer, plus a minimum of four directors representing a minimum of four of the six regions across Canada. All must be residents of Canada and members in good standing of CKC and CNASA. No more than two directors may be elected from any one region and a director must reside in the region they represent. Secretary/Treasurer positions can be combined. Term of Office is January 1st of the year following election. My life with dogs started with Golden Retrievers in 1990. I became very involved in training in obedience and developed an interest in dog sports. I wanted a dog that I could take from the conformation ring, to the Flyball lanes, back to the obedience ring, and win! I decided on an Australian Shepherd and Can. CH. JFCoventry’s Madeyalook CGC, TT, HIC, ASCA CD, CKC CDX, NJC, NGC, NAC, AD, AG-N, OAC, ONYX “Brodie” joined my pack. Well you can’t have just one Aussie and soon Kinring Australian Shepherds came to be. I have enjoyed some wonderful successes with my dogs, much of that success is due to the wonderful puppy owners that have become part of the Kinring family. Best In Show winners, High in Trial winners, perfect 200 scores, Obedience trail champions, Rally champions, Agility trail champions, CKC and ASCA stock titles, ASCA pre show Winners Dog award, ASCA Nationals High In Trial award, multiple Premiers, a Certified Service dog, Junior Handler dogs, and all are wonderful, loving, family members. I am a member of ASCA, CKC, on the executive for our Manitoba ASCA club, and now, the president of CNASA. During the day I teach High School Biology. Evenings, weekends, and summers, I teach obedience classes and do behaviour consultations. Lee Anne first became interested in purebred dogs after purchasing a silky terrier named Jazz in 2002. He started the adventure of conformation showing and obedience trials. By 2004, Lee Anne had grown tired of helping her husband chase down escaped cows or calves on their farm and started researching herding breeds. It was decided the Australian Shepherd would provide the best choice for their family. Over the past 10 years we have enjoyed sharing our lives with Aussies. We no longer have cattle, but still enjoy having horses, poultry and game birds on the property. 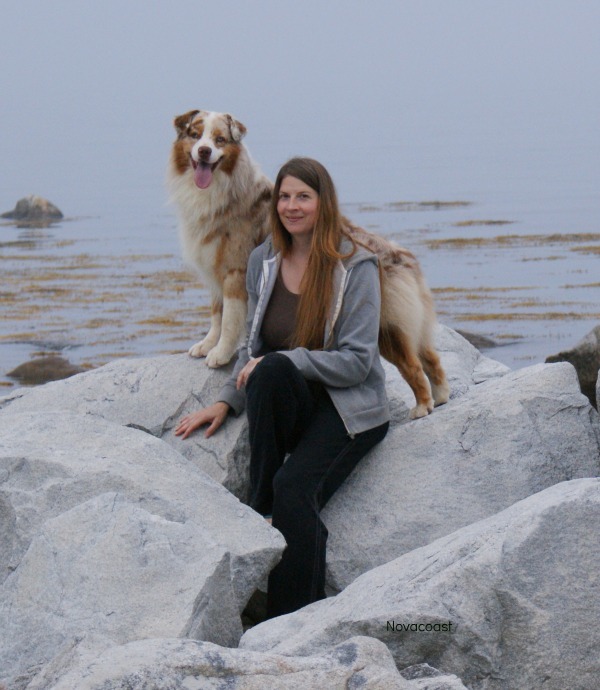 Aside from CNASA and CKC, Lee Anne is also a member of the Island Dog Club, Inc., Prince Edward Island, serving 15 years as combined secretary/treasurer and currently standing as treasurer. 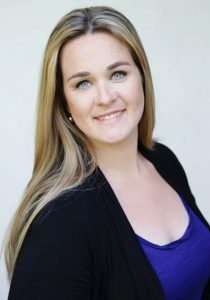 Her day job involves working full time as the office administrator, and health and safety environment coordinator for a consulting company comprised of engineers and scientists. Collin lives on the South Shore of Nova Scotia. 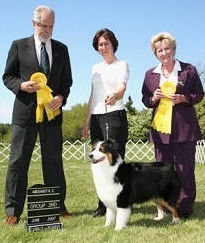 He has been involved with Australian Shepherds since 1995. His first Australian Shepherd was Pepper, a red merle. Pepper inspired Collin to get further involved with the breed. When Collin met Angela, they became involved in a local agility club and started doing rally and obedience with their dogs. They decided to go from there to the conformation ring and instantly became hooked. Novacoast Australian Shepherds was born and they began showing and breeding their Australian Shepherds. I have been actively involved with Australian Shepherds for the past 20 years, breeding my first litter under the prefix of Laredo, before permanently registering the kennel name of Casselcreek Aussies. Like so many in the fancy, I did not come up through the ranks of Junior Handling and my parents were not breeders. My involvement began with a companion Aussie from a CKC registered breeder, followed by an addition from HOF Las Rocosa, and my love for “all things Aussie” grew from there. Thanks to my wonderful owners and their talented dogs, Casselcreek Aussies have proudly earned titles in CKC, AKC, and ASCA in conformation, herding, obedience, rally, draft dog, scent hurdle, agility, flyball, nose work, etc. I love the versatility of this breed, to do anything we ask of them, and still calmly crash at our feet when the day is done. I am a Medical Transcriptionist and am very fortunate to work from a home office, which means my dogs are rarely left alone and workday coffee breaks are spent walking the fenceline with a lovely pack of Aussies. We live on 80 acres just east of Calgary. My husband stays busy with his Belgian mares and holding down the fort while I travel to most local weekend shows and also make the annual long-distance trek to ASCA Nationals. 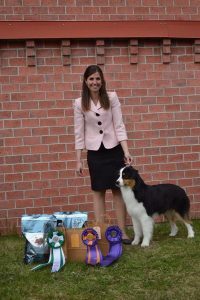 In previous years, I have held executive positions within the Australian Shepherd Fanciers of Alberta, and now as your Zone 2 Alberta Director. Shannon brought home her first Aussie in 2008, and with some encouragement from friends participated in her first conformation show. She finished her boy “Monty” with several puppy and group wins. She was hooked! Soon she entered the world of herding, agility, rally and obedience. A year later she brought home a second Aussie “Brighton” for her daughter to use in the junior handling ring. Her daughter started in the pee wee ring and continues to participate today having participated in junior handling provincials. 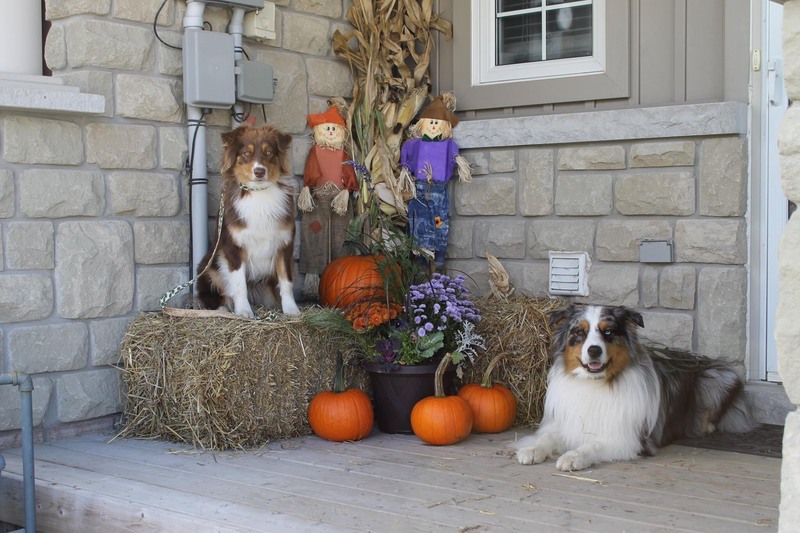 Shannon is an active member in her local breed club, a CKC member and a CNASA member, as well as the Secretary/Treasurer of the Manitoba Australian Shepherd Club (ASCA). Karen works for a company that makes Radiation Detection Devices. It is the only Canadian office, but they have offices across the US and in Europe and Asia. She has been in dogs for over 25 years. She and her Mom started with breeding, showing and raising Shelties. Since getting married, she convinced her husband they needed a dog. 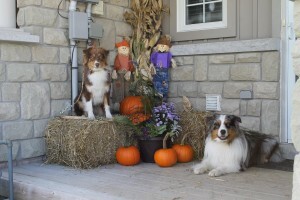 He grew up with a Lab and she loved the blue merle of the Shelties so they compromised and got their first Aussie – Tucker, born March 2011. They became fast friends with the breeder and have since brought a red tri female into their home as well – Holly, born Dec 2013. Tucker is Karen’s conformation show dog. 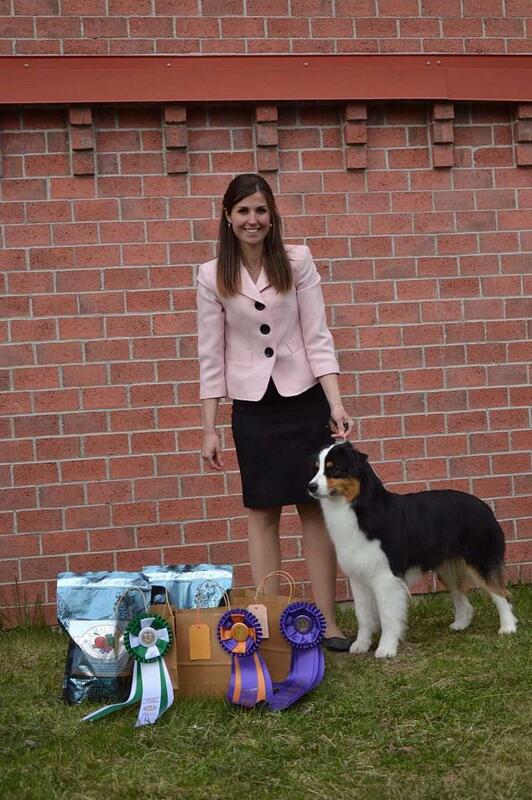 He is a CKC champion and they are working towards his Grand Championship. Tucker has also passed his Herding Instinct Test and will likely be trying herding lessons in 2016. Holly is to be another conformation prospect, but they are off to a slower start with her. So, Holly has introduced Karen to the world of agility, lure coursing and all things “fun” for dogs. Karen lives in Alliston, and also spends time in Parry Sound. Most weekends in the summer (if not at a dog show) they can be found at the lake. Both Tucker and Holly must have been fishes in another life because it’s the first place they head to when arriving at the cottage, and the last place they leave when heading home. My whole childhood, I have had different purebred dogs going from Brittany Spaniel, American Cocker to Pekingese. 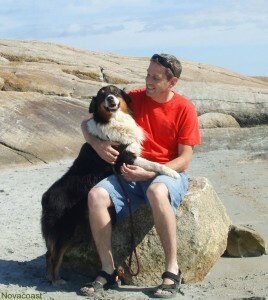 My love story for Aussies started in 2009 when I got my first pet/performance Australian Shepherd. With her, I learned a lot on the versatility of the breed by doing obedience, agility, rally, frisbee and herding. In 2012, I had the opportunity to have my first show dog from Thornapple kennel who put their faith in me with a special red merle dog. This is when I knew that showing dogs would not be a simple hobby, but a passion. I did handling and obedience classes. I also went to breeding and behavioural seminars. Since then, I became more active in the breed by becoming a member of CKC, ASCA and CNASA and starting my kennel. I am an intensive English teacher with 6 graders which means I spend my summers and my holidays with my dogs going to dog shows or teaching them new tricks. I come from Sayabec, in Quebec, but I have lived in Quebec City for the last 15 years. Two years ago, I bought a beautiful property in Neuville which is in the Portneuf area. Angela lives on the South Shore of Nova Scotia. 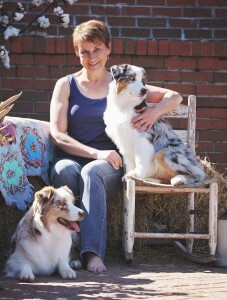 She was first introduced to Aussies when she met her partner, Collin, and his Australian Shepherd, Pepper. She was instantly fascinated with the breed. Growing up on a farm, Angela has been involved with dogs and other animals her whole life but has been active with the Australian Shepherd breed since 2005. She competes in conformation events and enjoys training for rally o, obedience and agility. Angela has been involved with local agility clubs and kennel clubs along with being a CKC, ASCA, and CNASA member. some small CKC herding trials with the help of some friends on my farm. I organize clinics with some very good herding teachers from United States and Ontario. I hope that my position in the Canadian National Australian Shepherd Association as Director may help to continue the good work of the CNASA to make shine the Australian Shepherd in the future without forgetting the roots and the utility of our breed.